Get ready to party in the fast lane when the Virgin Australia Supercars Championships returns to the Gold Coast, 25-27 October 2019. 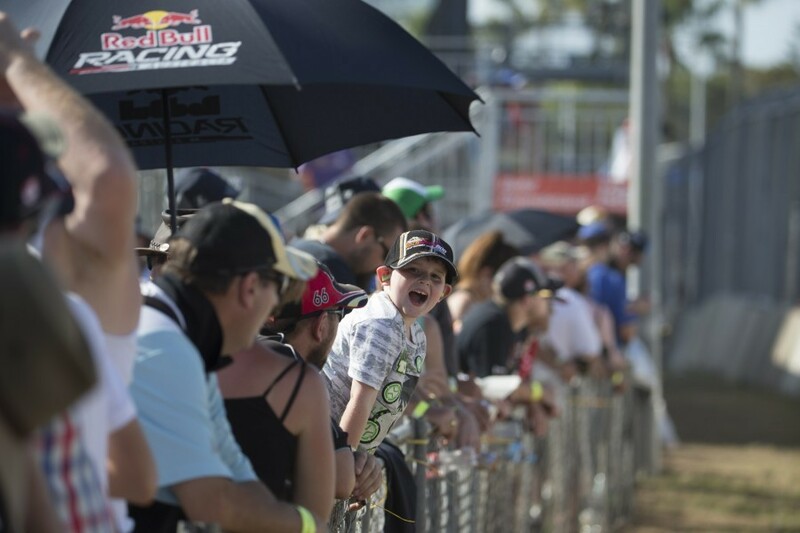 Grandstands provide a premium experience for your weekend at the Vodafone Gold Coast 600. Your ticket will guarantee an allocated undercover seat, providing protection from the elements. All the Grandstands offer enviable track viewing and big screens plus nearby food and beverage outlets and amenities. A detailed description of each Grandstand can be found below. As the name suggests, Pit Exit Grandstand is positioned with the prime view as the Supercars exit from pit lane. Located on the inside of the track you won’t miss any of the action that unfolds on pit straight. A big screen is positioned directly opposite the stand and beverage retailers are located just a short walk from your seat. This stand is best accessed through Gate 3. The Grid Stands are located on the outside of the track, directly opposite pit lane. Watch the start/finish of the races while experiencing all the action of pit lane and team garages. The stand enjoys closed circuit televisions, and food and beverage outlets and toilet facilities are just a short walk from your seat. This stand is best accessed through Gates 2 & 3. The Grid Stands are located on the outside of the track, directly opposite pit lane. Watch the start/finish of the races while experiencing all the action of pit lane and team garages. Big screens are located opposite the stands, and food and beverage outlets and toilet facilities are just a short walk from your seat. This stand is best accessed through Gates 2 & 3. Grid Stand 13 is located on the outside of the track opposite pit lane, overlooking pit exit. Watch the start/finish of the races while experiencing the action of pit lane. Food and beverage outlets and toilet facilities are just a short walk from your seat. This stand is best accessed through Gates 2 & 3. The Chicane Super Stand offers prime viewing of the first chicane (Turns 1-3), traditionally a high-action spot at race start. Noted as the fastest point on track, you will be witness to some of the event’s most memorable moments as the drivers brake into Turn 1. There are 4 viewing screens positioned on this Grandstand and toilet facilities are nearby. This stand is best accessed through Gate 3. The Beach Chicane Grandstand is located on the outside of the track and backs onto the pristine golden beaches of the Gold Coast. The beach chicane (Turns 6 -10) is one of the most exciting viewing points on track. Food and beverage retailers and toilet facilities are conveniently located close by. This stand is best accessed through either Gate 6 or 7. Tedder Ave Grandstand 23a is located on Turn 15 with prime viewing of the hairpin (Turn 14) and down pit straight. A big screen is located opposite the stand on The Hill and food and beverage retailers and toilet facilities are a short walk from your seat. This stand is best accessed through Gate 1. Tedder Ave Grandstand 23b is the largest grandstand on track and is located just after the Hairpin on the apex between Turns 14 & 15. A big screen is located directly opposite the stand on The Hill, and food and beverage retailers and toilet facilities are just metres from your seat. This stand is best accessed through Gate 1. Fanstands are for someone looking for something a little more comfortable than Trackside but with more flexible viewing options than Reserved Grandstands. Fanstands are unreserved, allowing you to move between any of the six Fanstands across the weekend with each offering a different racing view. A detailed description of each Fanstand can be found below. If you are a Ford fan, this is the Fanstand for you to cheer on your favourite teams and drivers. Located on the inside of the track, this stand is across from bitter rivals – Holden. These seats are best positioned to witness the action as the cars enter the beach chicane. For those fans wanting the freedom to wander around the circuit and soak up the colour and atmosphere of the Gold Coast’s biggest party, a Trackside ticket is the perfect option. Find your favourite vantage point for race viewing, be it atop The Hill or beachside at the chicane. Then experience the entertainment off-track, all included in your same-day ticket. Come for the racing, stay for the party! PLUS Kids 12 and under receive free Trackside admission all weekend with a paying adult. Take a behind-the-scenes look through the epicentre of all the action in pit lane at the Vodafone Gold Coast 600. Witness teams and drivers in preparation for the gruelling 600km of endurance racing. Three Pit Lane Walk sessions are available per day – get in quick as tickets are limited. Please note, closed toe footwear must be worn to participate in the Pit Lane Walk.